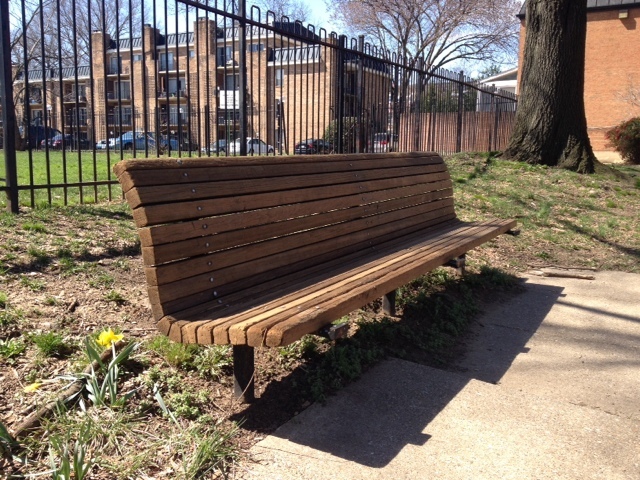 A community forum will be held tomorrow at Capitol Park Tower (301 G Street) from 10 am to 12 pm to discuss plans for the restoration of Amidon Sidewalk Park, a neglected strip of sidewalk and benches along 4th and G streets that frame Amidon Field. 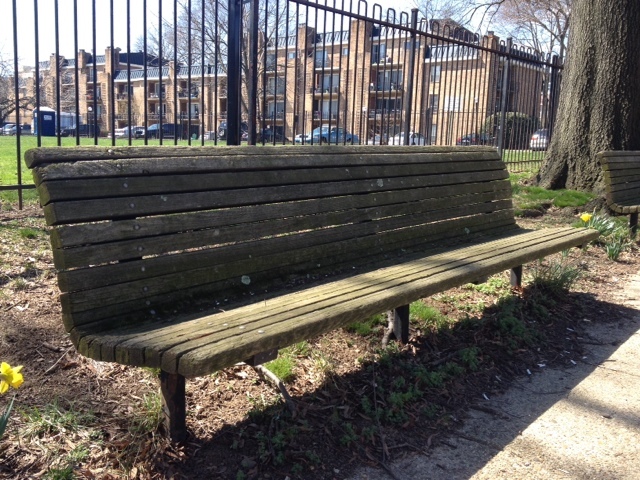 Untreated park bench on G Street. 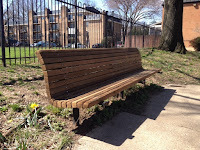 Restored park bench on G Street. 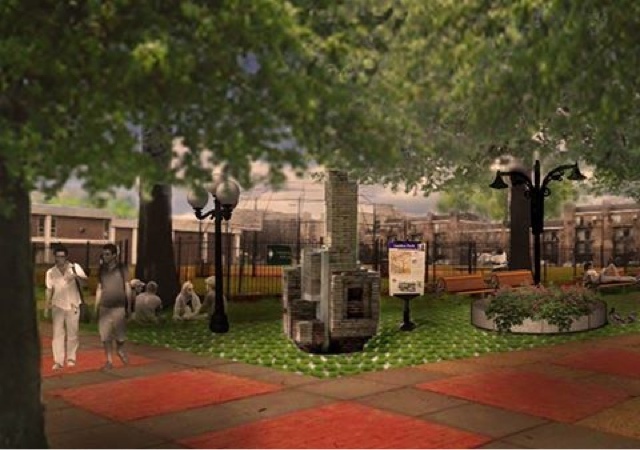 The Waterfront Gateway Neighborhood Association has spearheaded the effort to restore Amidon Sidewalk Park. In recent months, work has been done to determine whether the wood benches along the park can be restored. One of the benches was used as a test case and as you can see from the photos above, restoration is possible (at least for benches that are still intact). A design concept has also been commissioned. $100,000 has been set aside in the District's 2016 budget for the park and private-sector dollars may also be raised. Come to Capitol Park Tower tomorrow from 10 am to 12 pm and help shape your community! A groundbreaking ceremony for the new St. Augustine’s Episcopal Church will held at the construction site, located at 600 M Street, tomorrow at 11 am and is open to the public. The MTFA Architecture-designed church will replace the former building which was demolished starting in October 2014. Construction of the adjacent condo building by PN Hoffman began in late 2014 and is moving along quickly. At the new St. Augustine’s Church on Parcel 11 of The Wharf, there will be views of the church from M Street and Maine Avenue since it will be located at a prominent corner. There will be a soft curved edge in front of St. Augustine's to complement the curvature of Arena Stage across the street. 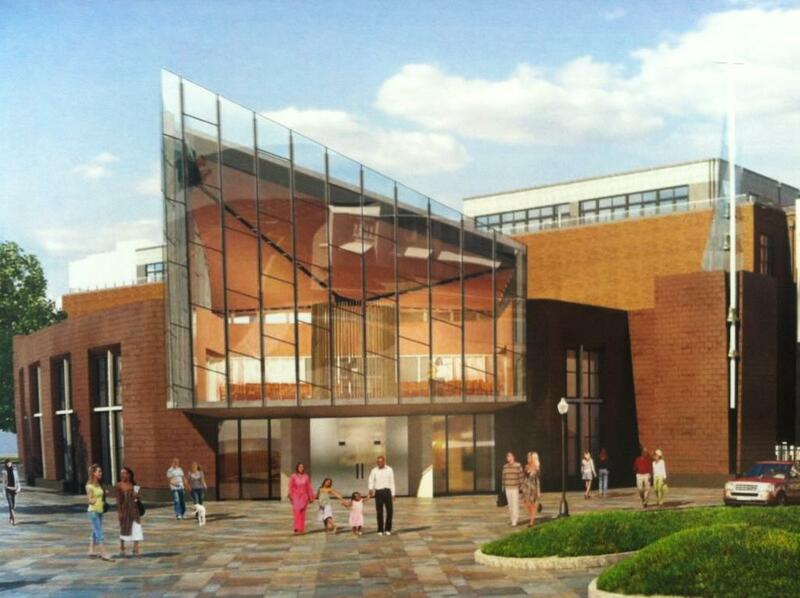 The two-story church will be approximately 15,000 square feet with the sanctuary located on the second floor offering views toward the Washington Monument. Also on the second floor will be classrooms and a library. On the ground floor, the entrance will lead to a vestibule that connects to classrooms and an all-purpose room, which will be available for community events, similar to how the former St. Augustine's building was used for meetings. The new church building is expected to open in 2016. Inaugural Market SW is Tonight! A full list can be found here. The market will occur every last Friday of the month through October and is a production of Diverse Markets Management, with the support of Waterfront Station and the SWBID. Unfortunately I'm out of town this weekend, so if anyone attends the market and takes pictures, please pass them along to me. Thanks! Tomorrow, Aya Community Markets will be set up for their weekly farmer's market from 10 am to 2 pm at the same location as Market SW. Aya moved this year from in front of Christ United Methodist Church to the Waterfront Station site. 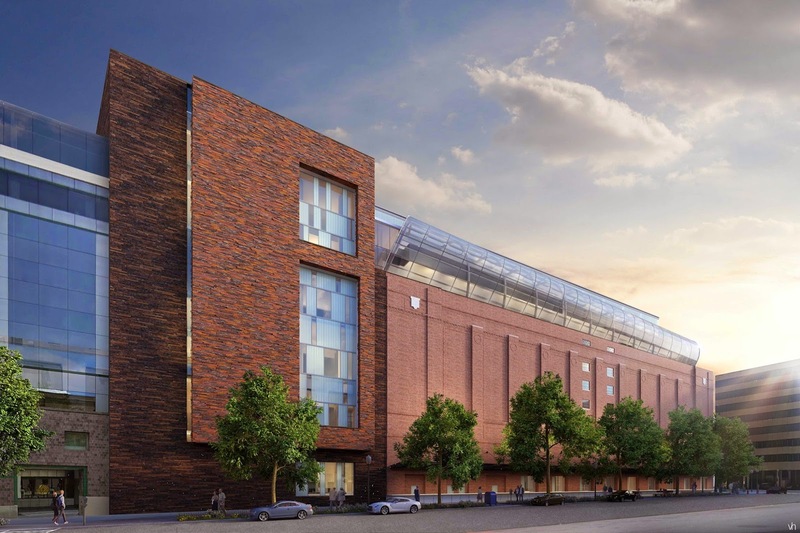 A building permit was recently issued for construction of the Museum of the Bible, located at 4th and D streets at the former Washington Design Center. There was a demolition ceremony for the project back in February and since then a 1980s addition has been demolished. It will be replaced with a new structure made of thin brick made to look like stacks of manuscripts. The 430,000 square-foot Museum of the Bible, which is scheduled to open in 2017, will include three exhibit floors that will tell the impact, narrative, and history of the Bible. A construction webcam has been set up looking towards the Virginia Avenue side of the site. Construction photo from early May. Over the past several months, the owners of Capitol Park Tower at 4th and G streets have made improvements to the common areas of the building, such as a new lobby, hallways, gym, bike storage, and lounge. In addition, the units now have new windows, appliances, countertops, and fixtures. About 95% of the interior improvements have been completed. These improvements follow the purchase of the property by UIP and Perseus Realty in 2013 and are part of the agreement made with the tenants association during the Tenant Opportunity to Purchase Act (TOPA) process. Despite the fact that Capitol Park Tower received historic designation for the 289-unit building and landscape in 2014, the next phase of improvements is an addition to the property. View of north building addition from I-395. At last week’s ANC 6D meeting, Adam Peters from Perseus Realty presented plans for a 295-unit addition. The rental apartments, designed by WDG Architecture will include units ranging from studios to 3BR units. About 24 units will be set aside as affordable housing under Inclusionary Zoning (IZ). A seven-story building is planned to the north of the existing building where the covered parking area is now located and a four-story building is planned on the east side of the property where the pool is now located, closer to Capitol Park II Condominium. An entrance to the new west wing of the property will be located on 4th Street near the I-395 underpass. New north building with an entrance on 4th Street. In his presentation to the ANC, Peters explained that several components of the original landscape plan as designed by Daniel Urban Kiley have been lost or altered, including trees, shrubs, and the pool. The development plan intends to reuse many landscape elements – for instance, the canopies used to cover the parking garage will be repurposed as covered walkways between the existing building and the addition. Existing sculptures will be repositioned throughout the property. 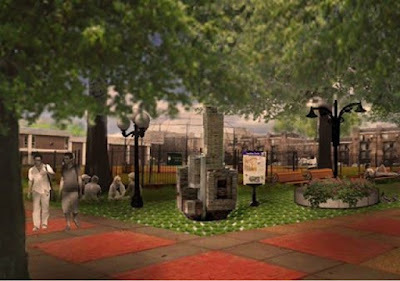 The development team intends to restore some of Kiley’s original landscape plan, including trees bosques and shrubs that were removed or died since they were originally planted. Courtyard features parking canopies reused as covered walkways. New amenities include two rooftop swimming pools, community room, fitness center, vegetable garden, playground, and a green roof on the original building. 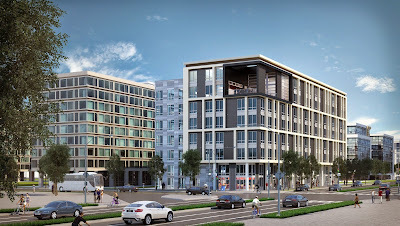 A total of 310 below-grade parking spaces will be built beneath the addition – the surface parking located on the G Street side of the building will be replaced with landscaping. All of these amenities will be available for residents of the entire property to use. Although the proposed development is by-right, Capitol Park Tower is a historic property so the ANC will vote in a future meeting on whether to support the development plan before the owners go before the Historic Preservation Review Board. Construction is expected to begin by the end of 2015 and last about two years. 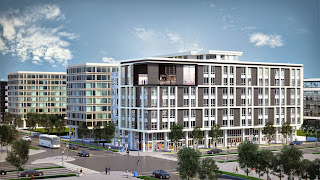 The north tower will be on the K Street lot and the south tower will be on the M Street lot. Ground floor retail with 20-foot ceilings will be located in the south tower at the corner of 6th and M streets, ideally a restaurant. 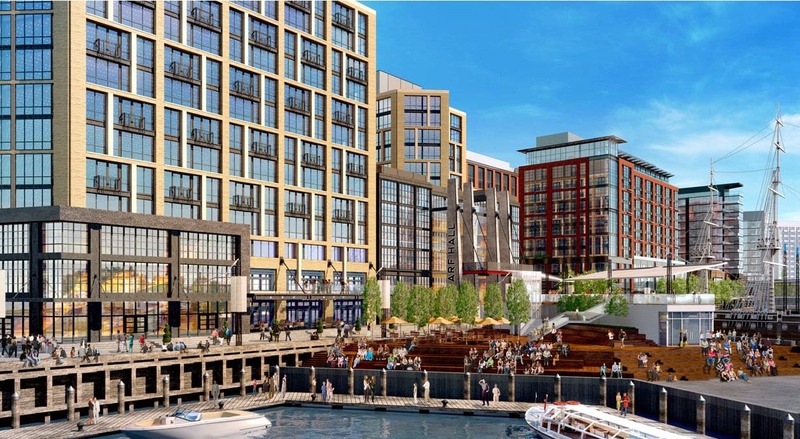 The south tower will also have a cut out on the top of the building for a large rooftop entertainment area where residents can gather and get a view of The Wharf. Meanwhile, the north tower will have loft units and a two-level gym. The ANC commissioners voted unanimously to support the revised PUD application, which will go before the Zoning Commission on June 11. The current development timeline calls for construction to begin around mid- to late April 2016 and exterior work on the north and south towers to be complete in December 2017 and March 2018, respectively. Construction is currently scheduled to be completed by November 2018. The new King-Greenleaf playground is coming along nicely compared to how it looked back in March. The play surface has now been installed, as well as new landscaping and sidewalks. It now looks almost ready to open! With rising temperatures, it would be nice if the splash park opened soon. Below are some progress photos of the playground and splash park that were taken last week. Condition of playground in March. Condition of playground last week. Splash park back in March. 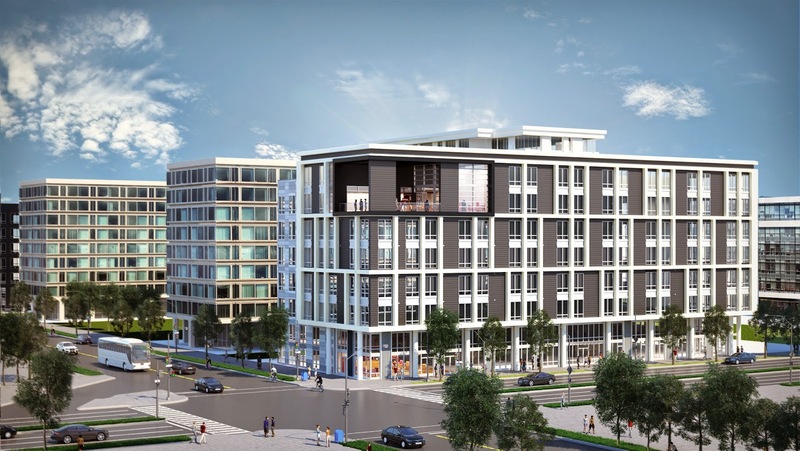 The Wharf Wins "Deal of the Year"
The Washington Business Journal awarded The Wharf with “Deal of the Year” in its annual Best Real Estate Deals series. The mile-long, billion-dollar plus development project was more than a decade in the making and construction of phase one finally began in March 2014. The first phase will include three apartment buildings and two condo buildings with more than 800 housing units, two office buildings, three hotels, Wharf Hall, retail, four piers, parks, and a new St. Augustine’s Church, along with a new waterfront promenade. Roughly half of the mile-long, 25-acre project area is now excavated. There are 70 dump trucks running four trips per day, 10 tower cranes and dozens of workers on site, with many more to come. The massive District Pier is nearly finished, which will stretch from Maine Avenue into the Washington Channel. Meanwhile, piles are being driven for the Transit Pier and test piles have been driven for the Market Pier. Repaving of Maine Avenue should be complete later this month. The new condos and St. Augustine’s Church building are the furthest along – construction is above ground and the elevator shaft is several stories in the air. Delivery is scheduled for spring 2016, over a year before other components of the first phase of development are supposed to come online. 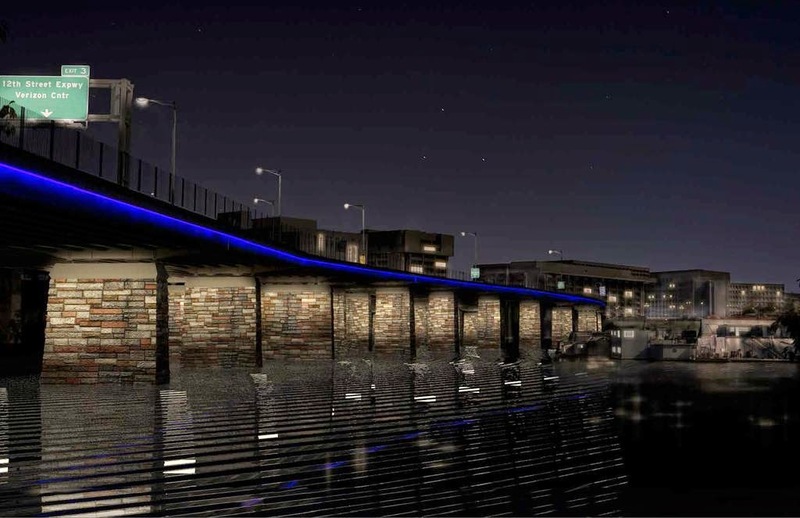 Next on the list to deliver in 2016 will be Waterfront Park and new lighting for the Case Bridge. A blue stripe will run along the northbound bridge and will be visible from The Wharf. The lighting scheme is more subdued than originally planned, due to input from the U.S. Commission of Fine Arts. If you want to keep track of the construction progress at The Wharf, construction cameras have been set up at different vantage points. In Other Wharf News: Jenny’s Asian Fusion restaurant has completed its relocation to the former Channel Inn café space and has reopened as Jenny’s at the Wharf. The café serves breakfast, lunch, and dinner. King Ribs is back! After getting his business license, Bufus Buchanan’s King Ribs stand is now open at Gangplank Park. 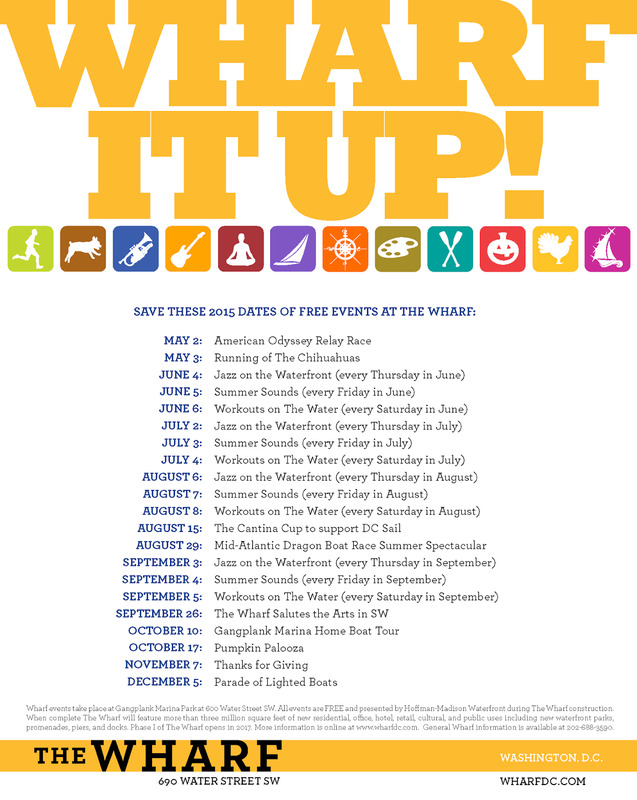 Below is a list of upcoming free events at Gangplank Park, including two events this weekend – The American Odyssey Relay Race on Saturday and the Running of the Chihuahuas on Sunday.